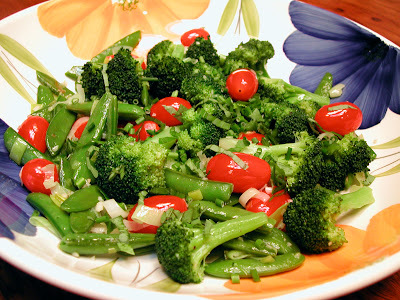 I did find these great sugar snap peas and some fresh broccoli, so I thought I would try something a little different. Different for me that is. I had a leek in the fridge and some grape tomatoes, so I decided to use everything. Why not? It turned out great. The veggies were tender with just a slight crispiness and the leeks, garlic, lemon and fresh herbs really woke everything up! Steam the sugar snap peas and broccoli in a steamer basket over boiling salted water for 4-5 minutes, or until crisp-tender. Drain and set aside. In a large skillet, heat the butter and oil over medium heat. Add the leeks and salt; cook, stirring, until softened, about 5 minutes. Add the garlic and cook for an additional minute. Add the sugar snap peas, broccoli, tomatoes, and more salt and pepper. Cook, stirring, until heated through. Squeeze the lemon over the veggies and add in the chives and basil. Serves 3-4. Thank you Annie to come up with another alternative,very very good.Bambola. Oooh, what a gorgeous salad!! This looks so healthy and delicious! I love broccoli. You asked me a question about beer. I must answer it! Do you have an email address? What a beautiful dish! You know, I could eat a plate of that for dinner and be very happy. Bambola, Thanks for the kind words. Veggiegirl, Thanks for visiting and I also enjoyed your blog as well. Hope to see you again. Em, If you love broccoli, your ok in my book! Jen, Thanks friend. Try it someday, it tastes as good as it looks.